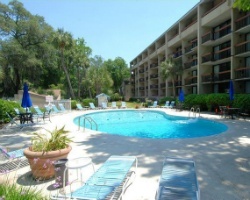 Come to South Carolina and enjoy the amenities of *Sea Crest Surf and Racquet Club* amid the subtropical beauty of Hilton Head Island! There are four private tennis courts and two outdoor pools (one heated). Guests have access to a third pool with deck and Tiki Hut overlooking the beach (one block away). There is a pool table in the resort's activity room. Island activities include golf, bicycling, and a number of water activities. Restaurants of all types can be found, plus more than 90 night spots offering the best in entertainment. Shopping, wilderness hikes, and historical tours add to the list of activities. *RCI Affiliated* Featuring a finely appointed 2 bedroom, 2 bath suite will accommodate 6 guests comfortably. Usage is annual in red season weeks 16. Maintenance fees paid annually. For more information or to make an offer, please submit the inquiry form.